Editorial Board : M.A. Amir-Moezzi, J. Chabbi, A. Cheikh-Moussa, P. Crone, J. Dakhlia, Cl. Gilliot, P. Guichard., B. Halff, B. Johansen, J. Langhade, P. Larcher, B. Lewis, Th. Philipp, Y. Ragheb, C.-J. Robin, J. Sublet, H. Toelle, G. Troupeau, K. Zakharia. Un Aspect Intéressant de L’Apologétique Coranique : Le Rappel Des Bienfaits D’Allah Et Ses Conséquences par Wagner Gaston, Arabica, Volume 16, Number 1, 1969 , pp. 1-14. LAGARDE (MICHEL) : Index du grand Commentaire de Fakhr al-dîn al-Rāzī, E.J. Brill, Leiden 1962, 82 + 359 p. par Arkoun, Mohammed, Arabica, Volume 45, Number 2, 1998 , pp. 143-144(2). Noah’s Lost Son in the Qurʾān, Gabriel Said Reynolds, Arabica, Volume 64 : Issue 2, p. 129–148. 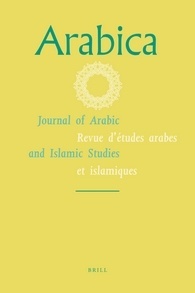 The Feminine Ending -at as a Diptote in the Qurʾānic Consonantal Text and Its Implications for Proto-Arabic and Proto-Semitic, Marijn van Putten, Arabica, Volume 64 : Issue 5-6, p. 695–705. The “ḥadīṯ literature” : What is it and where is it ?, Stephen R. Burge, Arabica, Volume 65 : Issue 1-2, p. 64–83. Between History and Exegesis : the Origins and Transformation of the Story of Muḥammad and Zaynab bt Ǧaḥš, Andreas Görke, Arabica, Volume 65 : Issue 1-2, p. 31–63. Muḥammad as an Episcopal Figure, Nicolai Sinai, Arabica, Volume 65 : Issue 1-2, p. 1-30.